Day 1-5: Common yellow-throat warbler reminds me of a little bandit. Day 6: State Line Look Out for an alfresco breakfast on the way to Bear Mountain. Extension: The Queensbury Hotel. Historic, modern, and comfortable. Extension: Yellow Warblers nest around Fort Edward, New York. Cost: $4,250 USD ex flights, a five day extension is $1,850 USD. Where: New York City and vicinity; Bear Mountain. Extension follows the Hudson River upstate to Fort Edward / Glens Falls New York. Length: 9 days + 5 day extension. Add 1 day if traveling from overseas. Physical Rating: Moderate, walking, light hiking. What: Follow the warbler migration up the Hudson River from New York City to Fort Edward. We appreciate you contacting us about our New York Spring Warbler Migration Tour. This trip is run by our travel partner Avian Adventures who will contact you directly. In a hurry, or need more details? To speak to someone now, please call +44 (0)1384 372013. 1. The Secret of Central Park. Did you know The Audubon Society calls New York City’s Central Park one of the best places in the United States for bird watching? We add expert birding guides for up-to-the-minute inside warbler-spotting intel. 2. Twenty Warbler Species in One Day: Plus various other resident and migrating song birds, woodpeckers, our resident hawks is about average for the spring migration in Central Park. 4. Dine like a Local: New Yorkers know where to eat, no trumped-up tourist restaurants for us. We will relax and enjoy the cuisine at great local (family owned) bistros and restaurants. 5. Of Ghost Towns and Warblers: The Doodletown ruins at Bear Mountain is a favorite nesting site of the endangered cerulean warbler. Hooded and golden winged warblers like it also. 6. Follow the Warblers up the Hudson: The Washington County Grasslands is our secret favorite place: Join us for a few extra days and meet the friendliest people in America - and do some great birding. Have you ever seen a bobolink mating display? We will spend eight days with top international birding experts first exploring Central Park and Jamaica Bay – with time for an evening harbor cruise around Manhattan. We will round out our New York City warbler adventure at Doodletown at Bear Mountain, just a scenic hour’s drive north, to seek out nesting cerulean. Extend your stay and follow the warblers up the Hudson River to Fort Edward, New York and the Washington County Grasslands where we should also encounter the amazing mating displays of the bobolink, plus northern harrier hawk, possibly nesting bald eagles, a multitude of songbirds, and of course, our warblers. Gerry Griffiths has always been an avid birdwatcher, and thoroughly enjoys sharing his love of birdwatching with others. As the founder of Avian Adventures, Gerry’s enthusiasm and knowledge have helped to establish the company’s excellent reputation, and he is totally committed to offering the best possible service. A former lecturer in Field Studies for Birmingham University, he has travelled worldwide, organising and leading many tours to Europe, Scandinavia, Israel, North, Central and South America, the Middle and Far East. Peter Scholes is an excellent field ornithologist. Pleasant and easy-going, he is enthusiastic and keen to share his findings with others. Peter is a member of the Fylde Bird Club’s Rarities Committee, and has travelled worldwide in his pursuit and study of birds. He has been a tour leader for Avian Adventures since its conception. Elise Boeger: After a successful career in magazine publishing, including Time Inc., The New Yorker, and Smithsonian, Elise now concentrates on her passions for wildlife, conservation, and nature. A New Yorker, Elise considers Central Park to be her backyard and she is there most days watching and studying its birds. Elise is an active member of the Explorers Club, Linnaean Society, and NYC Audubon. Meet at the historic Wales Hotel, on the Upper East Side, only a short walk from the heart of New York's Central Park. Meet your guides and tour mates, settle in, then enjoy a light lunch together at a neighborhood bistro. After lunch, we will have our first glance at what the Audubon Society calls "one of the best birding spots in the United States.” Central Park is a prime resting stop for wood warblers on their annual spring migration. After our afternoon tour, we head back to the hotel to rest, freshen up and have dinner together in a favorite local restaurant where the chef is the owner and the guests are family as soon as they walk in the door. We meet in the lobby and head over to a local diner for breakfast. They open early especially for our group, who says New Yorkers aren’t the friendliest people on earth? Here we will pick up our pre-ordered bagged lunch and head to Central Park for our first full day of birding. Central Park consists of 850 acres with many different habitats. Audubon has counted over 30 species of warblers here in a single “wave” or "fallout," and we should be right on time. Depending on where the birds appear, we will explore the Ramble, the North Woods, the Turtle Pond, the Loch, Belvedere Castle, and more. After a day of birding, we head back to the hotel to rest and freshen up. Tonight we get a unique perspective of the famous Manhattan skyline from the deck of our boat, on an evening Hudson River Cruise around Manhattan. We leave from the hotel and jump on the subway to Times Square. There we will see where the famous New Year’s Eve ball drops, and head by bus across town to the Hudson River. Dinner is in one of the oldest continually operational pubs in New York, The Landmark opened in 1868 (for America, that is ancient!) and walk another block or 2 to our ship. Get ready for great views of the Statue of Liberty, the Empire State, and Chrysler buildings, the Brooklyn, Williamsburg, and Manhattan bridges, Brooklyn and more. We meet in the lobby and head over to a local diner for breakfast at our friendly neighborhood diner again, then we head by subway to Brooklyn where we will explore some of the 500+ acres of Prospect Park. We will walk the wide paved paths through extensive woodlands, and visit the renovated boathouse, now an environmental center. Fredric Law Olmstead, also the designer of Central Park, designed Prospect Park and included rolling meadows, forested areas, and an extensive water system. Prospect Park was designated an Important Bird Area (IBA) by Audubon in 1998. Look for up to 35 species of warblers including Northern Parulas and Louisiana waterthrush, as well as vireos, Eastern bluebird, rose-breasted grosbeak, orchard, and Baltimore orioles, and more. Lunch is at the Bluestone café near the roller/ice rink. Enjoy fresh sandwiches, burgers, salads, soups and even a veggie burger that non-vegans will enjoy! Later, we head back to the hotel, refresh, and relax. Meet the group in the lobby or lounge for our daily bird listing and then enjoy dinner together at a local cafe, or spend a free evening exploring Manhattan on your own. After an early breakfast jump on the nearby subway for a ride to Queens and the Jamaica Bay Wildlife Refuge. This refuge, a stone’s throw from JFK International Airport is a poster child for environmental reclamation. We will start at the visitor’s center for a short talk on the amazing history of this 9,000-acre wetland refuge (both salt and fresh water) and head out to explore the trails. This is another resting place for migrating warblers including yellow warblers and yellow-rumped warblers, and also waterfowl and waders such as Great egret, snowy egret, little blue heron, tricolored heron, black-crowned night heron, and green heron, some of whom nest right here. Another highlight is watching the resident pairs of breeding osprey fish for their young. We will have a bagged lunch at Jamaica Bay, then head back to Manhattan to rest and refresh. Meet as a group in the lobby or lounge for our daily listing of spotted birds and then enjoy dinner together at a local cafe, or spend the evening exploring Manhattan on your own. Breakfast then back to Central Park, the hub of the spring warbler migration in New York City. The Park is a magnet for professional birdwatchers and wildlife photographers – bring your camera! These folks create a high flow of up-to-the-minute spotting information, and we will be tuned in: the Ramble? Cherry Hill? Sparrow Rock? Where ever warblers decide to be, we will venture too. Last year we were able to enjoy a very rare Kirkland’s thanks to the “warbler hotline.” In the evening, meet together in the lobby or lounge for our daily listing of birds spotted and then enjoy an early dinner together at a local cafe, or spend the evening exploring Manhattan on your own. Tomorrow we leave for Bear Mountain. Enjoy an early morning coffee or tea in Wales’ comfortable lounge, then we head north in our private van. We will stop for a bagged al fresco breakfast on the Palisades overlooking the Hudson River. This spot is famous for its granite cliffs and the peregrine falcons that nest on them and glide the thermals at eye level to where you stand to watch. Have your camera ready! After our break, we continue up the Hudson to the Bear Mountain area, check into our lodge, and have a light lunch at a local café. Then it is on to Doodletown, an essential breeding ground for the highly endangered Cerulean warbler. Doodletown, once a mining and logging settlement is now is a ghost town, the foundations of some of the 70 homes, a church, a school, the graveyard and shops that was once a thriving village are still visible along the paths. We may see hooded, golden-winged, Blackburnian, red-eyed vireo, redstarts, and Louisiana waterthrush and more as well as the cerulean. You may spot green heron in the pond, or an olive-sided fly-catcher or a pileated woodpecker. Doodletown is an Audubon IBA. This evening we go back to the hotel to refresh and relax then regroup for the daily listing of our bird spotting. We will have a delicious dinner at a local restaurant. Today we have a full day to explore Doodletown and the surrounding area. Lunch will be at a local café, then, depending on the weather and intelligence from our network of local birders, more exploring before we go back to the hotel for a rest and refresh, our daily bird listing, then a final dinner together with those who will finish their tour here. Those who will not be joining us on the Hudson River Valley Extension will head back to Manhattan and the Wales Hotel by private car. There you will have a free afternoon and evening to explore the city or visit Central Park for a final day’s birding. Dinner is on your own. Enjoy the morning in Manhattan then head back to the airport by private car for your trip home. After breakfast, we follow the Hudson River north stopping at either Constitution Marsh or Buttercup Farms,(depending on the weather and the bird reports) both IBA designated areas. Along the way enjoy river views and the miles and miles of hardwood forests that cover the rolling hills and mountains on either side. This is a side of New York that most visitors never experience. Lunch will be a local café along the way. We will arrive at the historic Queensbury Hotel in Glens Falls, New York in the late afternoon. This small town, the site of many Revolutionary war battles was initially called “Chepontuc” a Mohawk word meaning “difficult place to get around” because of the waterfall that blocks the Hudson River. Later it was dubbed, “Hometown USA” by Look magazine for its small-town feel and big-city amenities. After a short rest, we will meet for dinner either at the lovely bar-restaurant in the hotel or at one of the many locally owned restaurants or pubs on Main Street. After breakfast in the hotel, we will head to the Washington County Grasslands. Here we will meet the director of the Friends of the Washington County Grasslands, Laurie LaFond. She will give us an overview of how this fantastic habitat for meadow birds and raptors has been returned to nature and has achieved IBA status through the efforts of the local community. We should be on time to see the tremendous displays of mating bobolinks. Meet a local vet/wildlife photographer and learn some of his favorite bird photography tips. Lunch is in a local owned bakery / café. Important Tip: Save room for dessert. Past groups have insisted on a second trip to this café to sample more of their homemade bakery treats; blueberry pie, raspberry pie, melt-in-your-mouth cinnamon rolls and more Meet in the Queensbury’s lobby for our daily bird listing accompanied by live piano music. Then it's off to dinner together at a local restaurant. Depending on the weather and the progress of the migration we will either go back to the Grasslands, or explore the forest paths and streams of an old dude ranch turned spiritual retreat, or head a bit further north. Tonight, we will dine in one of the best restaurants in New York State. This is husband and wife team came together over their love of cooking, Steve is a graduate of the famed Cambridge School of Culinary Arts and an alumnus of some of the best restaurants in the Boston Massachusetts area. Rebecca won the Food Network’s reality show, "Chopped" in 2009. If the weather is good we will eat on the spacious, cozy porch of the house they turned into Morgan and Co. This is a highlight of any visit to the Hudson River Valley. We will be greeted by Park Ranger and avid birder, Linda White. She will give an insider's view, taking us to places off the radar for most visitors. Linda will provide us with an overview of the historical and natural wonders of the park as she points out its amazing wildlife. We will have a bagged lunch together, and then it’s back to Glens Falls for our final dinner in the Hudson River Valley. .
After breakfast at the Queensbury, we will load up our van for the ride back to Manhattan, stopping along the way for lunch and possibly a bit of birding. In Manhattan, we check back into the Wales Hotel with perhaps enough time for an afternoon walk in Central Park or along Madison Avenue, or just relax at the hotel. We will have a final celebratory dinner in a local restaurant. . Depart for Home After breakfast, if there is time, you may want a short final walk in Central Park on your own, or stroll down Madison Avenue, or just relax at the Wales. Then it is off to the airport by private car for your trip home. . Dates: May 7 - 14, 2019. 6-day extension: May 15 - 20, 2019. Need flights to and from London? Contact us. Included: En-suite accommodation based on twin occupancy; meals; transportation in New York and services of leaders. All park fees and a donation to the Friends of the Washington County Grasslands IBA are included. Excluded: Travel insurance, ESTA, drinks and items of a personal nature. ► This tour is best suited for adults with moderate to avid birding experience. ► Binoculars are highly recommended, a camera is suggested. A spotting scope will be provided by the leaders. ► The Hudson River Valley can be cooler and wetter than New York City. Layers and rain gear are recommended. ► There should be minimal insects at this time of year, however, it is wise to take caution as we may encounter ticks. Long pants and tick repellent are recommended. ► Expect a lot of walking, most of it will be on paved or semi-paved paths. Hiking shoes or boots offering good support are recommended. ► Breakfasts and lunches may be bagged but dinners will be comfortable and delicious. In Manhattan, The Upper East Side: The Wales Hotel is just a block away from birding in Central Park. Here, tree-lined Madison Avenue still has the boutiques and family-owned restaurants that made it famous. Times Square’s frantic pace and flashing lights are but a 10-minute subway ride away - yet this is a different world. You will see why the Upper East Side neighborhood is a favorite for native New Yorkers. The Wales Hotel is an oasis of old-world charm coupled with thoroughly modern comfort and convenience. Built over one hundred years ago, it has retained the ambiance (and marble stairways, rich woods, and Beaux Arts details) that welcomed flappers, tycoons and returning World War II vets. Amenities include Free WiFi and high-speed internet, a fitness center, a business center, a lovely roof-top terrace (in season), complimentary coffee and tea in the lounge, 24-hour concierge and New York City at your fingertips. The Queensbury Hotel in Glens Falls, New York is on the List of Historic America Hotels, is located in the heart of Glens Falls, New York. On our evenings here, the sound of a live piano or a jazz quartet in the grand lobby/lounge may accompany our daily bird sighting compilation (grab a drink and relax.) Afterward, we will walk along Main street for dinner at one of the local restaurants featuring homemade regional specialties by top-notch chefs many of whom have traded the fast pace of New York City for the birdsong of the Hudson River Valley. Amenities include Smoke-free rooms, indoor pool, 24-hour fitness center, complimentary tea and coffee in the common area, Free WiFi and luscious toiletries. There are two restaurants on site.The Queensbury Hotel. Central Park: According to Audubon, the species count for an entire day in Central Park may occasionally top 100. Says international bird expert and tour leader, Gerry Griffiths, “A spring day can produce 20 species of gorgeous American wood warblers, including ovenbird, Blackburnian, magnolia, bay-breasted and chestnut-sided warblers as well as American robin, blue jay, Swainson’s thrush, scarlet tanager, American goldfinch and Northern cardinal.” Numerous other songbirds and raptors including the resident red-tail hawks. At Jamaica Bay, we should encounter additional warblers plus breeding osprey, egrets, migrating shorebirds, terns and wildfowl. Bear Mountain should reveal breeding cerulean, hooded, golden-winged, American red-start, and worm-eating warblers and red-eyed vireo, Baltimore oriole, red-bellied and pileated Woodpecker and Louisiana waterthrush. 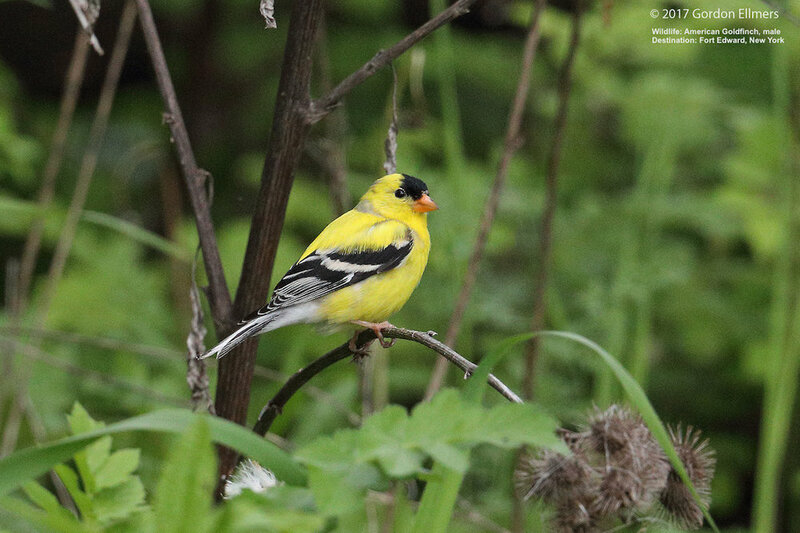 Further up the Hudson River, we should encounter additional warblers plus bald eagles (nesting), red-tail hawk, Northern harrier, barred owl, upland sandpiper, Eastern meadowlark, and nesting bobolink, amongst other species. The Washington County Grasslands IBA is a breeding ground for bobolink, here it is possible witness their amazing mating displays. Central Park: 180-year old Central Park is run by the Central Park Conservancy, a private, not-for-profit organization, formed in 1980 by a group of concerned citizens determined to improve Central Park. Today, they manage Central Park under a contract with the City of New York. The park is a vital resting area for migrating birds on the Atlantic flyway. A steady stream of birdwatchers ensures that protecting the specific habitats within the Park that are necessary for these birds remains a priority. Short-eared owls were once one of our most common owls. Now, less than 100 remain. The Washington County Grasslands Important Bird Area (IBA) is critical to the survival of Short-eared owls in New York State. The area provides important habitat for Short-eared owls, Snowy owls and over 100 other bird and animal species. It supports 10 of 11 of New York's most imperiled grassland bird species, including Short-eared owls, Northern harriers, American kestrels, Eastern meadowlarks, Horned larks, Upland sandpipers, Grasshopper sparrows and Bobolinks. Friends of the IBA (FIBA) is the only nonprofit acquiring and permanently protecting critical habitat in the Washington County Grasslands IBA for NY’s endangered and at-risk grassland birds. Friends of the Washington County Grasslands IBA is a 501(c)(3) nonprofit land trust working to conserve critical habitat for New York's endangered, threatened and at-risk grassland birds. Our land and Alfred Z. Solomon Grassland Bird Viewing Area, picture below, are located in Fort Edward, NY. FIBA's annual Winter Raptor Fest event educates youth and adults about native raptors and generates support for our efforts to conserve their habitat. Owl Watches, Guided Walks and Tours offer residents and visitors the chance to see and explore this special place - and perhaps encounter some of these amazing birds for themselves! Laurie LaFond founded Friends of the IBA in 2010 with a vision of restoring nesting populations of state endangered Short-eared owls to the area. We received nonprofit status from the IRS in 2011. FIBA is a proud member of the Land Trust Alliance. Laurie Lafond will be our guide at the Washington County Grasslands IBA. On December 19, 2018, Governor Cuomo of New York announced that FIBA had won a $63,191 grant for the purchase of an additional 64 acres earmarked as protected wildlife habitat. Our visit to The Washington County Grasslands includes a donation. Today, environmental regulations and changes in attitudes have enabled a rebirth. The Glens Falls Chronicle reported in 2017 that there are more than 400 pair in New York. Eagles are not the only returning species. Other raptors, waterfowl, songbirds, and small mammals are all reappearing in certain areas. But the job is not finished, the story not ended. The return of the wildlife is precarious at best. Nature tourism provides the jobs and economic benefits that keep habitat conservation and preservation a priority for the people and government of New York State. The benefits of habitat and nature conservation impacts the economic health of the communities both in the city and upstate. In Manhattan, we will be staying on the Upper East Side’s tree-lined Madison Avenue, a little piece of old New York. This is a mostly residential area, reidentifying itself as the place in Manhattan for young families. We will be staying in one of the oldest continuously operating hotels in Manhattan, the elegant bit personal, Wales Hotel. Our meals will be taken at local, cafes and restaurants, many of which are family owned. We will be walking to Central Park from the hotel, about a block, and occasionally using public transportation. While in New York State we will be visiting small towns on both sides of the Hudson River. These towns, many of which had been of significant economic importance to the United States from the time of the first settlers, have in the last few decades, seen their once thriving industries become obsolete, change, or disappear. With them have gone the jobs and careers that made this region thrive. Today there is a re-awakening, a ground-swell of appreciation for New York States real riches: It’s abundant natural resources. Subsistence farmland is being re-imagined as specialized organic farms, orchards, and vineyards. Their harvests have inspired award-winning chefs from around the world to open small, exquisite restaurants. New wineries and craft breweries are springing up in locations that yesterday had double-digit unemployment. The not-for-profit River Keepers started in 1966 by a group of fishermen disgusted with the polluted, stinking, dying state of the Hudson River, in conjunction with citizen scientists and activists continues to oversee and safeguard the recovery of this magnificent waterway. None of these changes have come easy, but together they create an environment that encourages the return of the winged, furred, and finned species that New York State, and the world, was losing. Our presence, as bird watching, nature loving tourists validate the efforts these folks are making and give the economic reason for the government to support the preservation of New York States natural resources.